Ten years ago Chinese HiFi products were barely taken into serious consideration by Western World audiophiles: their extremely low prices were suspect, to say the least. Nonetheless, there were several Companies that were moving their production to China or even worse, that used to “re-brand/re-badge“ Chinese products, in order to sell them at ten times the original price. During these last ten years things have changed a lot, and many Chinese Companies have earned a good reputation among audiophiles worldwide. Mei Xing is a very large Company that, between 1991 and 1998, has built tube electronics for many other Companies. With their own brand Ming Da have decided to enter the market as first role players. The name stands for striving for better construction and, actually, Ming Da products are definitely not the usual run of the mill Chinese products. It is interesting to read the description of their mission and the impressive list of technical certifications they have achieved. Moreover, the Italian distributor Ming Da Italia, who kindly supplied this test sample, performs extremely severe quality control tests to ensure the products perform at their best without problems for a very long time. I've enthusiastically agreed to review their MC 34 ASE amplifier, because it is a reasonably priced, powerful, versatile and nicely built integrated tube amp, equipped with a push pull EL34 tubes. A kind of classic among tube amplifiers. 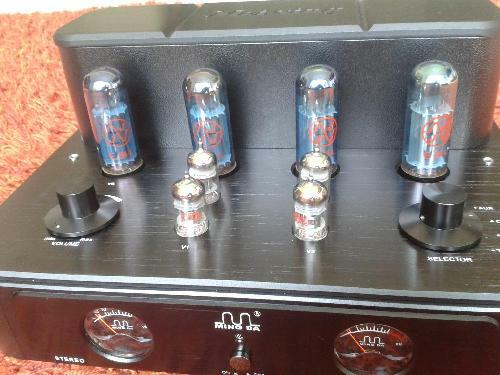 This MC34 ASE uses a set of 4 EL34 vacuum tubes from JJ Tesla, two ECC82's and two ECC83's. The push-pull of the EL34's generates a 40 watt per channel power output, which is sufficient in most cases. It also offers 4 line inputs, a nice aluminium remote that controls volume setting and muting (not the inputs!) and the usual two sets of speakers outputs for 4 and 8 Ohm connections. This amplifier is nicely crafted, on a par with the best international products. It feels solid, thanks to the quality of the materials, and it's easy to use, thanks to its excellent level of ergonomics. The VU meters add a classy touch of retrò looks while the (removable) plexiglass top cover adds some extra safety when the amp is used in an environment with children or pets. I've tested this integrated amp with different ancillaries (sources and speakers) so to be sure to fully understand its personality. Besides the usual speakers in my listening room I've also used two pairs of bookshelf speakers that I was reviewing in the same period, namely the Rega RS1's and the JMR Folia (both around 1000€/pair). Let me start with the obvious: this is a tube amplifier and it sounds exactly like you'd expect. 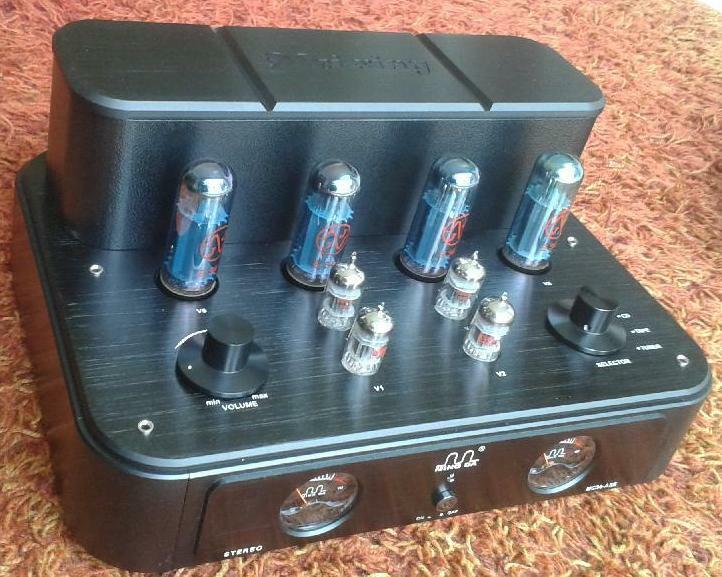 Moreover, it's a tube amplifier based on EL34's and this can be clearly detected if you're familiar with this kind of tube. It sounds neither euphonic or slow, as it possesses precision, detail and a very distinctive presence effect in the mid range. Voices and guitars, for example, are clean, precise and never hidden or masked by other instruments. For this reason choirs are extremely rich, involving and emotionally full of pathos. Only male voices might appear, from time to time, a bit lighter than desired. Female voices, instead, seem to be placed closer to the mics, a bit closer than they should be. Even drums and percussions are sharp and well defined: the snare drum, for example, is powerful and quick, which you'd not expect from a classic tube amplifier. In the high range you'll enjoy that usual velvet touch that many tube amplifier contribute to the music they reproduce. For example, the cymbals in Pat Metheny's Last train home or the highest notes of the pipe organ in Koyaanisqatsi sound with plenty of grace and warmth, while they should be a little bit more metallic (the cymbals) and brassy (the pipe organ notes). Everything is supported by a powerful and solid bass range, which appears to be slightly softer than desired in the first octave. The EL34's do their best to reproduce the lowest bass notes with energy and control, but there are physical limits that can't be avoided or ignored. For example, it is quite easy to detect a loss of control when playing the lowest synthetic bass notes of Massive Attack's “Teardrop”, or the lowest pipe organ notes of P. Glass's “Koyaanisqatsi” or Cantate Domino (Proprius). It is clear that the energy reservoir is limited and, while you can still detect the single notes, the amplifier can't control these as desired. Summarizing, the tonal balance of this amplifier is clear and open in the mid range, solid and powerful in the bass, soft and tendentially warm in the highs. Moreover, this amp is capable of a very good performance in terms of retrieving details and, inded, so much so that it succeeeds in exposing each and any recording fault. In other words: if you're looking for an amplifier that mixes everything together and delivers a warm and soft blob of sound, regardless of the quality of the recording, you should look elsewhere. This Ming DA MC34SE puts bad recordings to shame and shines with the best ones, more or less like any serious, true high fidelity component should. The claimed output power is 40 watts per channel and certainly they're all there, ready to punch. On the other hand, let's forget the usual urban audiophile myth that claims 1 watt by tubes equals to 2 watts generated by transistors. That's simply false. Indeed, this amplifier is a true 40 watter, nothing more than that: actually, it is not too difficult to force the VU meters above the redline (and +3dB above!). Just play some rythmically complex track, with plenty of thumping bass, and the physical limit of this amplifier can be reached with ease. This has happened with 90 dB sensitivity loudspeakers into a 20 sqm listening room, to be more precise. The energy the 4 EL34's generate can be not sufficient, on certain tracks and with less sensitive loudspeakers inside larger rooms, for example. Of course, I'm talking of unusually high pressure levels, those you can't normally reach if you live in a flat. In more normal situations it is hard to reach the 0dB level on the VU meters. The 3D soundstage is good, with a very impressive sense of depth. Moreover, the stereo image is completely independent from the speakers, in the sense that you can't clearly detect their position. The height of the image is the least impressive aspect of the 3D performance of this amplifier. Laterally, the scene extends beyond the speakers while the stability and the focus of the image is truly outstanding. Solid and stable as a rock. As you might expect, because of the slightly forward character of the mid range, voices are always slightly forward as well. The same happens with string instruments, while, as said, female voices appear closer to the mic than expected. This amplifier offers, as usual, two sets of speakers posts, depending on the impedance. I've tested both the outputs with different speakers and I've always found the 4 ohm output to be slightly better sounding than the 8 Ohm one. It sounds more solid, precise and harder to stress. Hence, my advice is to test both outputs, independently from the claimed speakers impedance. Let the ears decide, not the numbers. Those bitten by the upgraditis bug might find interesting the possibility to test different kinds and brands of tubes. I've always found this upgrade path very dangerous and potentially confusing: at the end of it all you can't truly understand the way your amp sounds since each tube has its own sonic fingerprint. Feel free to experiment with different mains and speakers cables as well. This amplifier is quite heavy and stable but you can experiment with different absorbing feet. The stock ones aren't all that bad, either. One final warning: the output tubes become very hot, hence the plexiglass cover should always be kept in place if there are children or pets in the listening room. Otherwise, it can be removed. As already said, this amplifier is very nicely designed, built and finished. 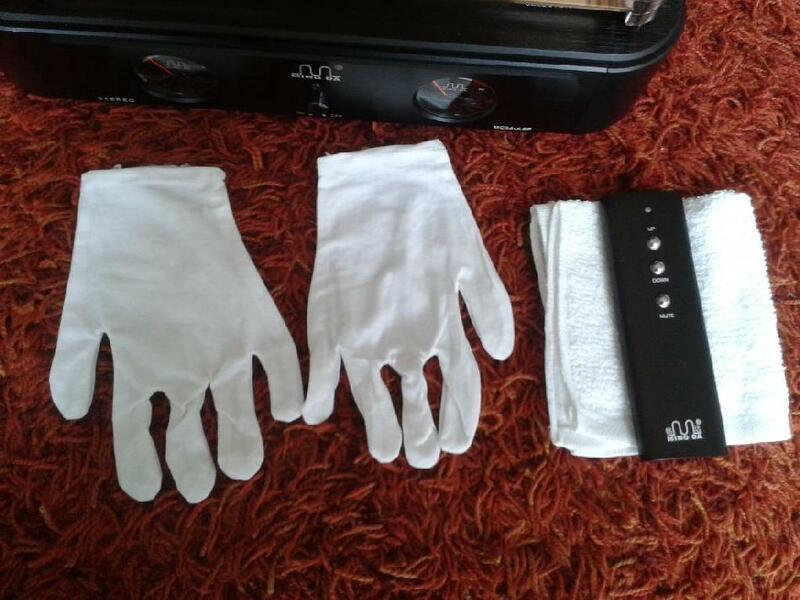 A set of cotton gloves and a soft cotton cloth are also included! So, no complaints from this point of view. As for ergonomics and user-friendliness, it should be remarked the remote doesn't control the inputs selector. 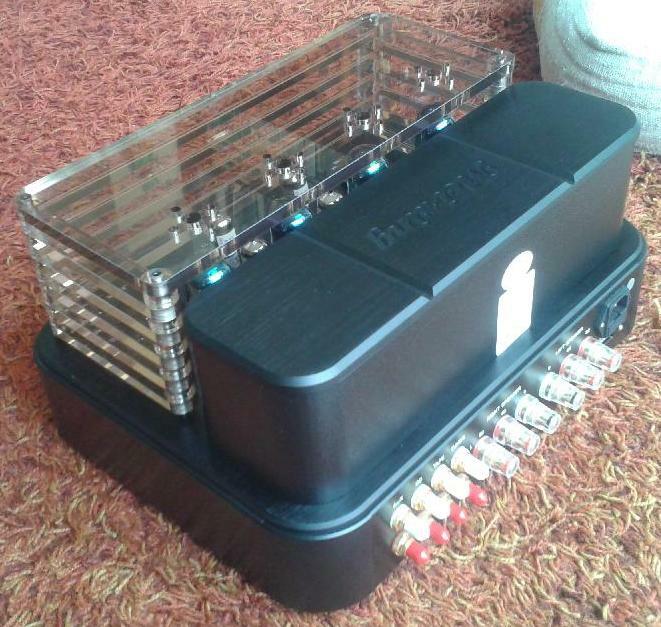 Moreover, when the plexy cover is in place it is almost impossible to reach the volume knob and the inputs selector. Not good. The volume control resets to its zero position every time the unit is switched off (not good for reviewers! :-)). The muting switch on the remote has a nice progressive feature. I've found the blue led light quite annoying. Definitely too bright. A very nice, modern, solid, reliable tube amp. On my wishes list I read a more recessed mid range and an extra dynamic kick with the most demanding tracks and musical genres. Jazz, classical and acoustic music lovers will find this amplifier simply amazing, while rock and electronic fans might find it too lazy and well-educated. To each his own. 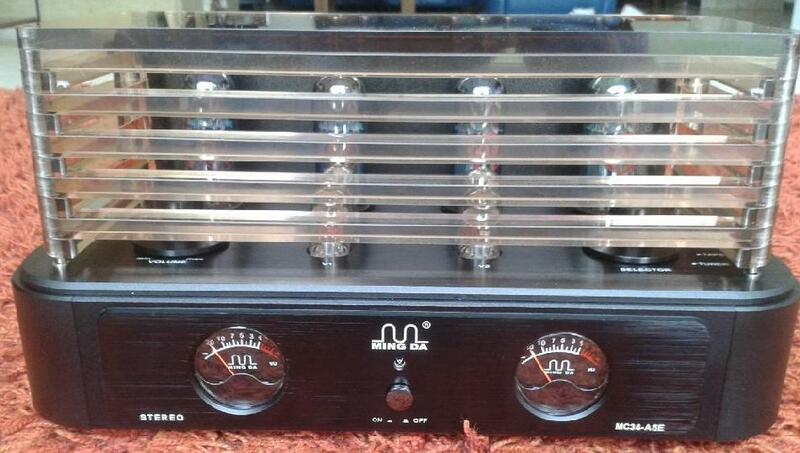 This amplifier is extremely well made, with cool looks and very good sound. It could easily be the heart of a good mid-class HiFi system, capable of supporting relatively consistent upgrades of speakers and sources. It feels at home with high quality ancillaries but even with budget-class partners it can add its classy touch. In this price range competitors are aggressive but this nice amplifier can fiercely face them without fear: it has lots of interesting features to offer and delivers a sound that can be the perfect choice for acoustic, jazz and classical music. A sincere thank you to Ming Da Italia for having supplied the test sample.